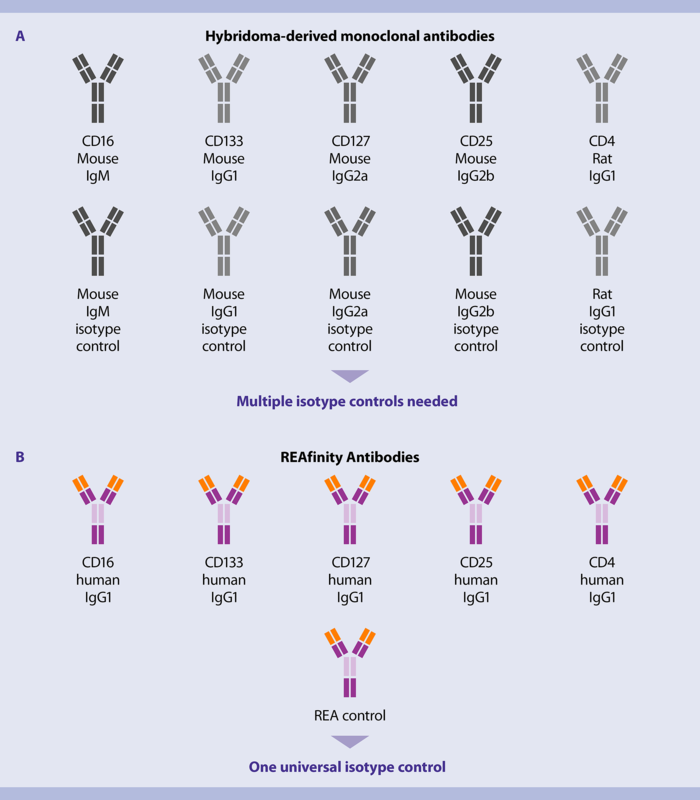 REAfinity Antibodies are recombinant antibodies that provide superior lot-to-lot consistency and purity compared to mouse or rat hybridoma-derived, monoclonal antibodies. They have been recombinantly engineered to produce highly specific antibodies that require no FcR blocking step. Additionally, they all have the same IgG1 isotype, requiring less isotype controls. Mass spectrometry analysis of purified antibodies shows that REAfinity Antibodies are defined products, while hybridoma generated antibodies can be a mixture. They are derived from a defined DNA sequence, which encodes only one type of heavy and light chain, ensuring high antibody purity. Production under biologically and chemically defined, standardized culture conditions in mammalian cells, resulting in high lot-to-lot consistency. Analytical, biochemical, and cell-based testing of every manufactured lot. Mass spectrometry analysis of purified antibodies shows that REAfinity Antibodies are defined products, while hybridoma generated antibodies can be a mixture. (A) Mass spectrometry analysis of two examples of hybridoma-generated monoclonal antibodies shows that both contain a second light chain with a molecular weight of approx. 23,635 Da. In one example bottom left, the amount of the contaminating light chain was by far exceeding the productive light chain of approx. 24,142 Da. 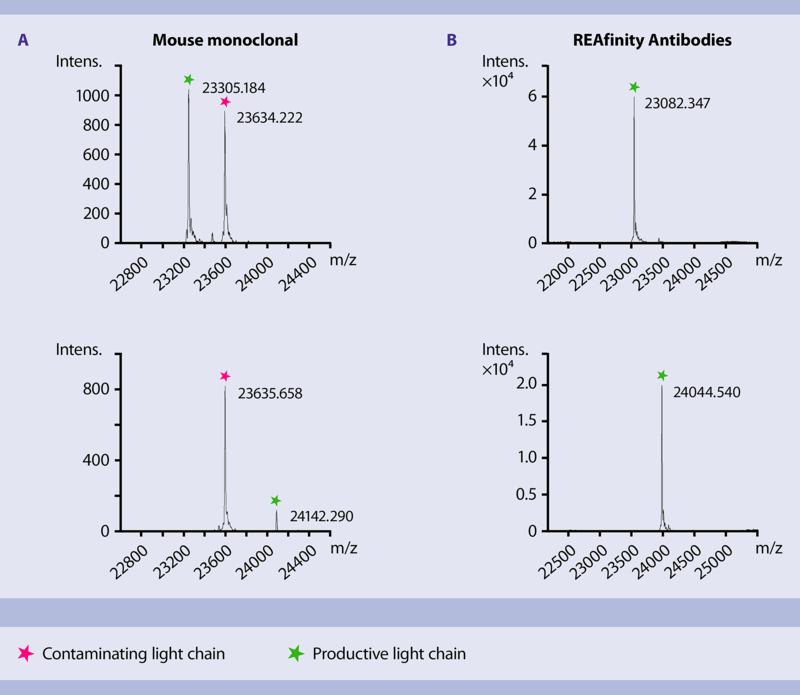 (B) Two examples of recombinant REAfinity Antibodies show pure light chain populations. REAfinity Antibodies reduce the complexity of panel design with only one isotype control required. All REAfinity Recombinant Antibody clones contain the same specifically mutated human IgG1 sequence as their constant region. This offers the possibility to work with only one type of isotype control, reducing the complexity of experiment planning and saving time. Hybridoma-derived monoclonal antibodies on the other hand, are composed of antibody isotypes derived from different species and therefore require multiple isotype controls. This complicates not only the management of reagent inventory, but also panel design when setting up experiments. 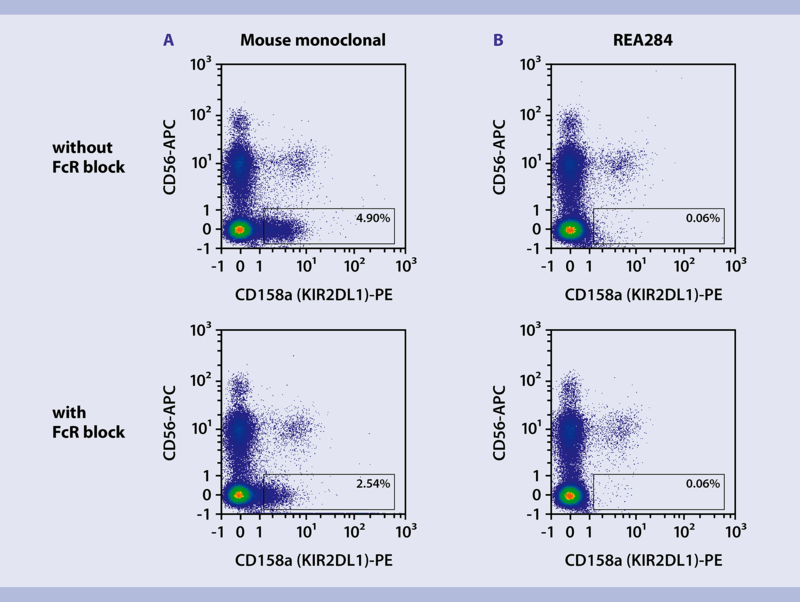 Specific detection of human CD116+ cells with clone REA 211. Specific detection of human CD116+ cells with clone REA 211. Human PBMCs were stained with either a PE-conjugated mouse monoclonal antibody (A) or PE-conjugated REAfinity Antibody (B) recognizing CD116. Cells were also stained with CD14-FITC. Cells were analyzed by flow cytometry on the MACSQuant® Analyzer 10. Cell debris and dead cells were excluded from the analysis based on scatter signals and propidium iodide (PI) fluorescence. Staining with REAfinity Antibodies shows no background signal, even without FcR block. 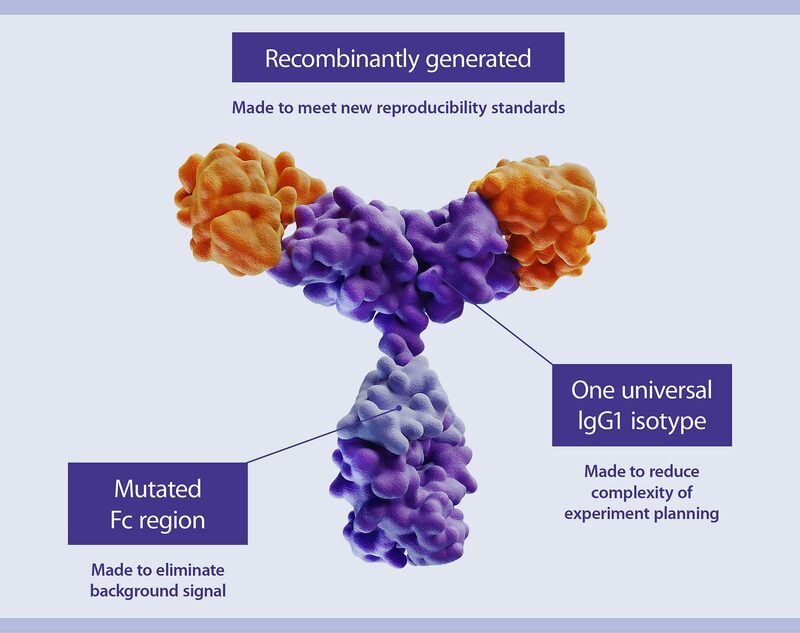 All REAfinity Recombinant Antibodies contain a specifically mutated human IgG1 Fc region that abolishes their binding to Fcγ receptors. This allows for background-free analysis and eliminates the need for additional blocking steps such as using a FcR blocking reagent. Staining with REAfinity Antibodies shows no background signal, even without FcR block. Human PBMCs were stained with either a mouse monoclonal CD158a-PE antibody or REAfinity CD158a-PE (clone:REA284). Staining was performed without (top) and with (bottom) FcR block. The mouse monoclonal antibody binds unspecifically to CD56-negative cells (A). Staining with the REAfinity Antibody, shows no background signal Cells were analyzed by flow cytometry on the MACSQuant® Analyzer 10. Cell debris and dead cells were excluded from the analysis based on scatter signals and propidium iodide (PI) fluorescence. REAfinity Recombinant Antibody clones are available for hundreds of specificities.They are conjugated to a variety of fluorochromes to address multicolor flow cytometry needs. Current options include traditional dyes, like FITC, PE, APC, aa well as Miltenyi Biotec´s proprietary Vio® and VioBright™ Dyes. Let Cap’n T Cell take you on a ride through the wonderful world of REAfinity Recombinant Antibodies. In this video, he will explain the benefits of using REAfinity Antibodies for flow cytometry experiments and will show you the features that make these antibodies so unique. The documentary highlights the concerns raised by key stakeholders to understand if this recent awareness in reproducibility is truly a crisis or an opportunity to lay down some guidelines that will strengthen our faith in scientific data and outcomes going forward.